This definition indicates that a critical element of the U.S. psychological operations capabilities includes propaganda and by extension counterpropaganda. Joint Publication 3-53 establishes specific policy to use public affairs mediums to counterpropaganda from foreign origins. During World War II the United States Joint Chiefs of Staff defined psychological warfare more broadly stating "Psychological warfare employs any weapon to influence the mind of the enemy. The weapons are psychological only in the effect they produce and not because of the weapons themselves." Although the first Great king of the Achaemenid Empire was known as a conqueror, he is also remembered for his tolerance towards those he defeated. To avoid a revolt by the newly conquered peoples, Cyrus the Great showed respect to their customs and allowed them to continue to practice their religions. He also freed 40,000 Jewish slaves in Babylon, sent them back to Judah and funded the building of a new temple in Jerusalem, which gave him the title "Liberator" and Messiah in the Old Testament. Cyrus is also known for the creation of his new Imperial Guards, "The Immortals". Notably, in mid-battle, they removed the dead from the battlefield so whether the battle is won or lost, their enemies never truly saw a dead Immortal. The name comes from the fact that no Immortal appeared to have died. According to ancient historians such as Herodotus, they have been said at times to wear a thin tiara over their face to give them a faceless, menacing look that contributed to their "deathless" reputation. Although not always accredited as the first practitioner of psychological warfare, Alexander the Great undoubtedly showed himself to be effective in swaying the mindsets of the populaces that were conquered in his campaigns. This fact is evident upon study and research into the remaining historical records regarding the terms of peace from the reign of Alexander of Macedonia. Though few records exist, they indicate that Alexander, or at the very least his advisers, were very shrewd negotiators and well versed in achieving diplomacy. To keep the new Macedonian state and assortment of powerful Greek tribes from revolting against their leader, Alexander the Great left some of his men behind in each city to introduce Greek culture, control it, oppress dissident views, and interbreed. Alexander paid his soldiers to marry non-Greek women. He wanted to assimilate people of all nations. Genghis Khan, leader of the Mongolian Empire in the 13th century AD, united his people to eventually create the largest contiguous empire in human history. Defeating the will of the enemy was the top priority. Before attacking a settlement, the Mongol generals demanded submission to the Khan, and threatened the initial villages with complete destruction if they refused to surrender. After winning the battle, the Mongol generals fulfilled their threats and massacred the survivors. Examples include the destruction of the nations of Kiev and Khwarizm. Consequently, tales of the encroaching horde spread to the next villages and created an aura of insecurity that undermined the possibility of future resistance. Subsequent nations were much more likely to surrender to the Mongols without fighting. Often this, as much as the Mongols' tactical prowess, secured quick Mongol victories. Genghis Khan also employed tactics that made his numbers seem greater than they actually were. During night operations he ordered each soldier to light three torches at dusk to give the illusion of an overwhelming army and deceive and intimidate enemy scouts. He also sometimes had objects tied to the tails of his horses, so that riding on open and dry fields raised a cloud of dust that gave the enemy the impression of great numbers. His soldiers used arrows specially notched to whistle as they flew through the air, creating a terrifying noise. The Mongols also employed other gruesome terror tactics to weaken the will to resist. One infamous incident occurred during Tamerlane's Indian campaign. Tamerlane, an heir to the Mongol martial tradition, built a pyramid of 90,000 human heads in front of the walls of Delhi, to convince them to surrender. Other tactics included firing severed human heads from catapults into enemy lines and over city walls to frighten enemy soldiers and citizens and spread diseases in the closed confines of a besieged city. The results were thus not only psychological since in 1347, the Mongols under Janibeg catapulted corpses infected with plague into the trading city of Kaffa in Crimea, making it one of the first known uses of biological warfare. After the beginning of the Spanish Civil War, the Nationalist General Queipo de Llano started broadcasting transmissions to be heard by Republican zone listeners. Over loudspeakers he could be heard saying: "Red soldiers, abandon arms. Franco forgives and redeems. Follow the example set by your comrades who have joined our ranks. Only then you will achieve victory, happiness at home, and peace in your heart." An example of a World War II era leaflet meant to be dropped from an American B-17 over a German city. See the file description page for a translation. One of the first leaders inexorably to gain fanatical support through the use of microphone technology was Germany's Adolf Hitler. By first creating a speaking environment, designed by Joseph Goebbels, he was able to exaggerate his presence to make him seem messianic. Hitler also coupled this with the resonating projections of his orations for effect. British Prime Minister Winston Churchill made similar use of radio for propaganda against the Germans. The British set up the Political Warfare Executive to produce and distribute 'black' and 'white' propaganda (see Categories of psychological warfare section for definitions). Through the use of powerful transmitters, broadcasts could be made across Europe. Sefton Delmer managed a successful black propaganda campaign through several radio stations which were designed to be popular with German troops while at the same time introducing news material that would weaken their morale under a veneer of authenticity. During World War II, psychological warfare was used by the military. The German Stukas used a high-pitch siren attached to the plane to lower the morale of their enemies when they performed air raids on enemy front. The siren is commonly compared to the sound of airplanes falling from the sky in modern cinema. The invasion of Normandy was considered successful in part because of the displayed fusion of psychological warfare and military deception. As an example, before D-Day, Operation Quicksilver, one element of Operation Fortitude, which itself was part of a larger deception strategy (Operation Bodyguard), created a fictional "First United States Army Group" (FUSAG) commanded by General George Patton that supposedly would invade France at the Pas-de-Calais. American troops used false signals, decoy installations and phony equipment to deceive German observation aircraft and radio interception operators. When the actual invasion began, the success of Fortitude was that it misled the German High Command into believing the landings were a diversion and of keeping reserves away from the beaches. Erwin Rommel was the primary target of the psychological aspects of this operation. Convinced that Patton would lead the invasion, Rommel was caught off-guard and unable to react strongly to the Normandy invasion, as Patton's illusory FUSAG had not "yet" landed. Confidence in his own intelligence and judgement rendered the German response to the beachhead ineffectual. The term "Cold War" was coined by the English writer George Orwell, after the dropping of the first atomic bombs in 1945 had ushered in a new world also foreseen by H.G. Wells. It described a world where the two major powers—each possessing nuclear weapons and thereby threatened with mutual assured destruction—never met in direct military combat. Instead, in their struggle for global influence they engaged in ongoing psychological warfare. 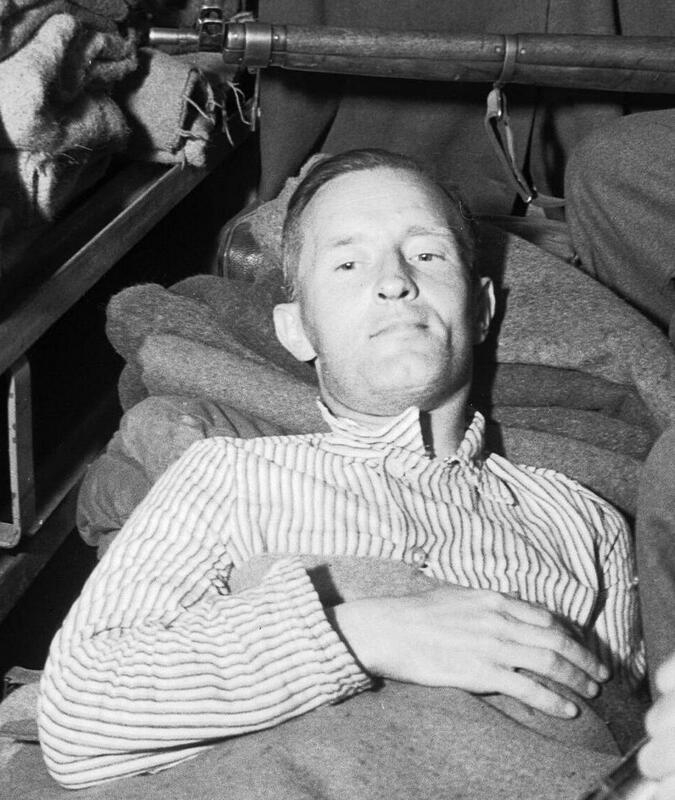 William Joyce, who was "Lord Haw-Haw" to British wartime listeners, now silenced and under arrest, lies in an ambulance under armed guard before being taken from British Second Army Headquarters to a hospital. Projecting repetitive and annoying sounds and music for long periods at high volume towards groups under siege like in Operation Nifty Package. In Iraq and Afghanistan, U.S. counterinsurgency used music, most commonly American heavy metal or rock music, to confuse or scare local militia. Disturbing chicken noises were repeatedly played over a loud-speaker at Guantanamo Bay for over 25 hours as a form of sleep deprivation. Most of these techniques were developed during World War II or earlier, and have been used to some degree in every conflict since. Daniel Lerner was in the OSS (the predecessor to the American CIA) and in his book, attempts to analyze how effective the various strategies were. He concludes that there is little evidence that any of them were dramatically successful, except perhaps surrender instructions over loudspeakers when victory was imminent. It should be noted, though, that measuring the success or failure of psychological warfare is very hard, as the conditions are very far from being a controlled experiment. The other side of the above leaflet. This is the text of a speech given by Franklin D. Roosevelt, translated into German. Click here for a translation. In the German Bundeswehr, the Zentrum Operative Information and its subordinate Bataillon für Operative Information 950 are responsible for the PSYOP efforts (called Operative Information in German). Both the center and the battalion are subordinate to the new Streitkräftebasis (Joint Services Support Command, SKB) and together consist of about 1,200 soldiers specialising in modern communication and media technologies. One project of the German PSYOP forces is the radio station Stimme der Freiheit (Sada-e Azadi, Voice of Freedom), heard by thousands of Afghans. Another is the publication of various newspapers and magazines in Kosovo and Afghanistan, where German soldiers serve with NATO. In the British Armed Forces, PSYOPS are handled by the tri-service 15 Psychological Operations Group. (See also MI5 and Secret Intelligence Service). The British were one of the first major military powers to use psychological warfare in World War II, especially against the Japanese. The Gurkhas, who are Nepalese soldiers in British service, have always been feared by the enemy due to their use of a curved knife called the kukri. The British used this fear to great effect, as Gurkhas were used to terrorize Japanese soldiers through nighttime raids on their camps and they were terrifying also to Argentine soldiers, most of them conscripts, during the Falklands War. The purpose of United States psychological operations is to induce or reinforce attitudes and behaviors favorable to US objectives. The Special Activities Division (SAD) is a division of the Central Intelligence Agency's National Clandestine Service, responsible for Covert Action and "Special Activities". These special activities include covert political influence (which includes psychological operations) and paramilitary operations. SAD's political influence group is the only US unit allowed to conduct these operations covertly and is considered the primary unit in this area. Dedicated psychological operations units exist in the United States Army. The United States Navy also plans and executes limited PSYOP missions. United States PSYOP units and soldiers of all branches of the military are prohibited by law from targeting U.S. citizens with PSYOP within the borders of the United States (Executive Order S-1233, DOD Directive S-3321.1, and National Security Decision Directive 130). While United States Army PSYOP units may offer non-PSYOP support to domestic military missions, they can only target foreign audiences. The United States ran an extensive program of psychological warfare during the Vietnam War. The Phoenix Program had the dual aim of assassinating Viet Cong personnel and terrorizing any potential sympathizers or passive supporters. Chieu Hoi program of the South Vietnam government promoted Viet Cong defections. A U.S. Air Force O-2 of the 9th Special Operations Squadron dropping Chieu Hoi leaflets over the Republic of Vietnam. When members of the VCI were assassinated, CIA and Special Forces operatives placed playing cards in the mouth of the deceased as a calling card. During the Phoenix Program, over 19,000 Viet Cong supporters were killed. The CIA made extensive use of Contra death squads in Nicaragua to destabilize the Sandinista government, which the U.S. maintained was communist. The CIA used psychological warfare techniques against the Panamanians by broadcasting pirate TV broadcasts. The CIA has extensively used propaganda broadcasts against the Cuban government through TV Marti, based in Miami, Florida. However, the Cuban government has been successful at jamming the signal of TV Marti. During the Waco Siege, the FBI and ATF conducted psychological operations on the men, women and children inside the Mount Carmel complex. This included using loudspeakers to play sounds of animals being slaughtered, drilling noises and clips from talk shows about how much their leader David Koresh was hated. In addition, very bright, flashing lights were used at night. In the Iraq War, the United States used the shock and awe campaign to psychologically maim, and break the will of the Iraqi Army to fight. An American PSYOP leaflet disseminated during the Iraq War. 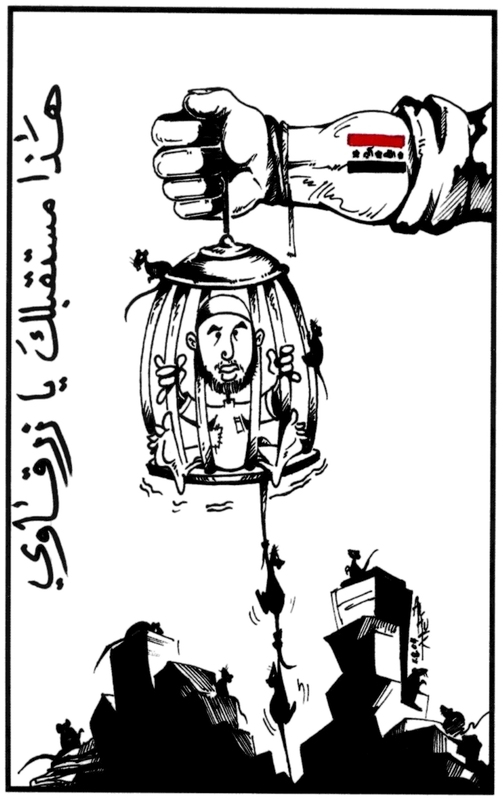 It shows a caricature of al-Qaeda in Iraq leader al-Zarqawi caught in a rat trap. The caption reads "This is your future, Zarqawi" (هذا مستقبلك يا زرقاوي). More recently, an article in Rolling Stone magazine alleges the United States has conducted psychological operations on its own senators and other decision makers in order to influence foreign policy. The article quotes U.S. Army Lt. Col. Michael Holmes describing how the U.S. Army illegally ordered a team of soldiers specializing in "psychological operations" to manipulate visiting American senators into providing more troops and funding for the war. According to Holmes, the orders came from the command of Lt. Gen. William B. Caldwell, a three-star general in charge of training Afghan troops. Gen. David Petraeus, commander of the forces in Afghanistan, ordered an investigation into the allegations made in the article. A U.S. Army field manual released in January 2013 states that "Inform and Influence Activities" are critical for describing, directing, and leading military operations. Several Army Division leadership staff are assigned to “planning, integration and synchronization of designated information-related capabilities." Truthful and not strongly biased, where the source of information is acknowledged. Largely truthful, containing no information that can be proven wrong; the source is not identified. Inherently deceitful, information given in the product is attributed to a source that was not responsible for its creation. Mr. Lerner points out that grey and black operations ultimately have a heavy cost, in that the target population sooner or later recognizes them as propaganda and discredits the source. He writes, "This is one of the few dogmas advanced by Sykewarriors that is likely to endure as an axiom of propaganda: Credibility is a condition of persuasion. Before you can make a man do as you say, you must make him believe what you say. ":28 Consistent with this idea, the Allied strategy in World War II was predominantly one of truth (with certain exceptions). ↑ "Forces.gc.ca". Journal.forces.gc.ca. http://www.journal.forces.gc.ca/vo9/no1/05-clow-eng.asp. Retrieved 2011-05-18. ↑ Ellul, Jacques (1973). Propaganda: The Formation of Men’s Attitudes, p. xiii.Trans. Konrad Kellen & Jean Lerner. Vintage Books, New York. ISBN 978-0-394-71874-3. ↑ Phil Taylor (1987). "Glossary of Relevant Terms & Acronyms Propaganda and Psychological Warfare Studies University of Leeds UK". University of Leeds UK. http://ics.leeds.ac.uk/papers/vp01.cfm?outfit=pmt&folder=64&paper=665. Retrieved 2008-04-19. ↑ Garrison, WC (1999). Information Operations and Counter-Propaganda: Making a Weapon of Public Affairs,Strategy Research Project, U.S. Army War College, p. 12 ,1999, April 4, 2012), 12. ↑ From "Overall Strategic Plan for the United States' Psychological Warfare, " 1 March 1943, JCS Records, Strategic Issues, Reel 11. Quoted in Robert H. Keyserlingk (July 1990). Austria in World War II. McGill-Queen's University Press. p. 131. ISBN 0-7735-0800-7. ↑ "Sada-e-azadi.net". Sada-e-azadi.net. http://www.sada-e-azadi.net/Joomla/index.php?lang=en. Retrieved 2011-05-18. ↑ 10.0 10.1 Executive Secrets: Covert Action and the Presidency, William J. Daugherty, University of Kentucky Press, 2004. ↑ Janq Designs. "Special operation - Phoenix". Specialoperations.com. http://www.specialoperations.com/History/Vietnam/phoenix.html. Retrieved 2011-05-18. ↑ "Is the U.S. Organizing Salvador-Style Death Squads in Iraq?". Democracy Now!. 2005-01-10. http://www.democracynow.org/2005/1/10/is_the_u_s_organizing_salvador. Retrieved 2008-12-16. ↑ "Another Runaway General: Army Deploys Psy-Ops on U.S. Senators". Rolling Stone. 2011-02-23. http://www.rollingstone.com/politics/news/another-runaway-general-army-deploys-psy-ops-on-u-s-senators-20110223?page=1. Retrieved 2008-12-16. ↑ "Claim: 'Psy-ops' targeted Steve Israel Newsday February 24, 2011". Newsday.com. 2011-02-24. http://www.newsday.com/long-island/politics/claim-psy-ops-targeted-steve-israel-1.2711615. Retrieved 2011-05-18. ↑ 17.0 17.1 Daniel Lerner. Psychological Warfare Against Nazi Germany: The Sykewar Campaign, D-Day to VE-Day. ISBN 0-262-12045-3 or 0-262-62019-7 (1949). George W. Stewart, New York; Reprinted (1971) MIT Press. Fred Cohen. Frauds, Spies, and Lies - and How to Defeat Them. ISBN 1-878109-36-7 (2006). ASP Press. Fred Cohen. World War 3 ... Information Warfare Basics. ISBN 1-878109-40-5 (2006). ASP Press. Gagliano Giuseppe. Guerra psicologia.Disinformazione e movimenti sociali.Introduzione del Gen.Carlo Jean e di Alessandro Politi Editrice Aracne,Roma,2012 . Gagliano Giuseppe. Guerra psicologia.Saggio sulle moderne tecniche militari,di guerra cognitiva e disinformazione .Introduzione del Gen.Carlo Jean , Editrice Fuoco,Roma 2012 . Paul M. A. Linebarger. Psychological Warfare. International Propaganda and Communications. ISBN 0-405-04755-X (1948). Revised second edition, Duell, Sloan and Pearce (1954). Wikimedia Commons has media related to Psychological warfare. Look up psychological warfare in Wiktionary, the free dictionary.